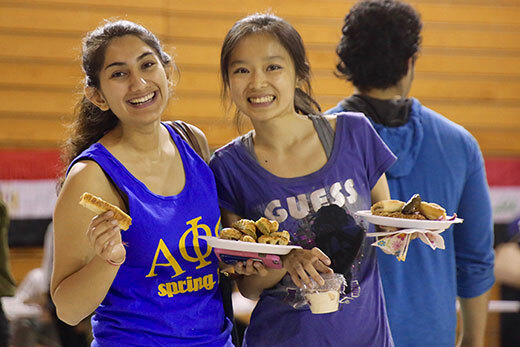 The fourth annual International Festival and World Cup Tournament, set for April 14, celebrates the diversity of Emory's student body and features cultural student organizations, food and performances. The semester may be winding down, but there's still plenty to do at Emory in the final weeks leading up to Commencement and the end of the academic year. Check out these 10 options ranging from entertaining to enlightening, all costing $10 or less. 1. Experience "(En)lightning Talks Atlanta." Get ready for a storm of ideas when Phi Beta Kappa hosts "(En)Lightning Talks Atlanta" on Thursday, April 6, at 7:30 p.m. in the Woodruff Arts Center. The free event will be moderated by Tracy Wilson and Holly Frey, co-hosts of the popular Stuff You Missed in History Class podcast, and two of the five featured speakers are Emory faculty members. Former U.S. poet laureate Natasha Trethewey, Emory's Robert W. Woodruff Professor of English and Creative Writing and director of the Creative Program, and internationally recognized number theorist Ken Ono, Emory's Asa Griggs Candler Professor of Mathematics, will be joined by popular Science magazine's 2016 Brilliant 10 honoree Will Ratcliff, European Union expert and political scientist Eleanor Morris and trans-disciplinary artist Cosmo Whyte for five-minute talks to spark your imagination. 2. Take part in a "Black Art Salon at the End of Universe." As the culminating program of Emory's exhibition, "Still Raising Hell: The Art, Activism and Archives of Camille Billops and James V. Hatch," this free event on Thursday, April 13, will explore the means and mediums through which black artists continue to push boundaries. Black Art Salon at the Edge of the Universe will consist of a collaborative performance by Jeremy Avalon of WERC Crew and graphic artist Keef Cross on the future of black art, followed by a discussion with Avalon, Cross and Leatrice Ellzy that connects contemporary art movements to the exhibition. Moderated by Kevin Sipp, project coordinator of Gallery 72. It begins at 6:30 p.m. in Woodruff Library's Jones Room. 3. Go global at Emory's International Festival and World Cup Tournament. On Friday, April 14, join the International Student Leadership & Advocacy Board; the Student Involvement, Leadership and Transitions office within Campus Life; and Emory Intramural for the fourth annual International Festival and World Cup Tournament. The free festival, slated for 6-9 p.m. on McDonough Field (rain location: Woodruff PE Center) celebrates the diversity of Emory's student body and features cultural student organizations, food and performances. 4. Bring the kids in your life to hear "Artful Stories." With the animals of Costa Rica — tiny frogs and huge toads, birds, crabs and a coiled-up snake — looking on, children will hear the ancient story of Sibu the creator and his struggle to complete the world. "When Woman Became the Sea," Susan Strauss’ version of this creation myth of the BriBri of Costa Rica, has been lushly illustrated by Cristina Acosta. This free Artful Stories event is set for Saturday, April 15, at 10 a.m. in Art of the Americas gallery in the Michael C. Carlos Museum. Kids will look closely at images of snakes in museum's galleries, and then make walking sticks that may, or may not, turn into a slithering serpent. The program is geared towards 3–5 year olds. 5. Go for a dip in the SAAC pool. Most outdoor pools don't reopen until late May, but the pool at the Student Activity & Academic Center (SAAC) on Emory's Clairmont Campus opened April 1, and is heated to keep the water to a minimum temperature of 78 degrees. SAAC membership is free for full-time undergraduate and graduate students who pay the student athletic fee; the facility offers discounted memberships for faculty and staff, as well as 14-visit guest passes that average to less than $9 per visit. The daily walk-up rate is $10. 6. Cheer for the Emory Eagles as their seasons draw to a close. • Emory Softball takes on Brandeis for double-headers on Friday, April 7, and Saturday, April 8. • Also on April 7, Women's Tennis hits the courts against Sewanee. You can also see the team in home matches on Tuesday, April 18, against Washington & Lee and on Saturday, April 29, against Georgia Gwinnett. • Men's Tennis takes on Washington & Lee at 1 p.m. on Tuesday, April 18. • Emory Baseball plays Birmingham Southern on Tuesday, April 18, at 3 p.m., then faces off against New York University for four games from Friday, April 21, through Sunday, April 23. 7. Get inspired at the Global Humanitarian Summit. Organized by Emory students, the Global Humanitarian Summit is a festival dedicated to bringing people together to learn, network, share, connect and inspire. The free event on Saturday, April 22, takes place in room 120 of the School of Medicine and includes in-depth talks, keynote speeches, interactive exhibits, workshops, film screenings and more, followed by a reception. 8. Take a break with Mozart @ the Med School. Step away from working or studying on Tuesday, April 25, at noon to hear the Vega String Quartet, Emory's world-renowned string quartet, perform in the lobby of the James B. Williams Medical Education Building. Mozart @ the Med School is free and open to the public. 9. Learn about the State of the Woodruff Health Sciences Center. Also on Tuesday, April 25, head over to the Woodruff Health Sciences Center Administration Building at 4:30 p.m. for the annual State of the Woodruff Health Sciences Center address. Hear about the vision, goals and achievements of the center from Jonathan S. Lewin, executive vice president for health affairs, executive director for Woodruff Health Sciences Center, president and CEO of Emory Healthcare and chair of the Board of Directors of Emory Healthcare. A reception follows on the WHSCAB plaza. 10. Relax in the spring beauty of Lullwater Preserve. Emory's Lullwater Preserve is always a lovely place for a walk, run or picnic, but is especially beautiful in the spring. Students can enjoy a break from studying for finals, or study outdoors when the weather is nice. Faculty and staff who want to take a break during the work day for fitness and friendship can join Meet Me @ Lullwater Preserve, weekly walks stepping off at noon on Wednesdays at the Lullwater gates from April 6 through May 11. You can walk on your own or with the group for activities and themes.